Q: How do you quadruple the percentage of visitors who buy? Video is a great education and training tool and obviously the world’s most popular entertainment medium, but in this article we’re talking about using video in web marketing. We’re talking about using video to sell. We’ll explain when to use it, why it works and how to get it done! We’ll also talk about metrics and show some research and results. First, let’s review why we use video in the first place. If you already plan to use video, scroll down to the “Let’s Do This” section below. ● When trust is critical – company leadership videos and client testimonials. ● When products or services are complicated and are helped by a visual explanation – product demonstrations help. Detail sells. ● When there is a lot of information to convey – too much to expect visitors to read it all. ● When there is a personality behind the business – an expert with a bit of charisma. Unlike text, video builds trust by conveying body language and tone of voice. Tone is really hard to communicate with text. Ever had an email misunderstood? Do you use exclamation points and smiley faces to try to convey tone when writing? (I do!) Be trustworthy. And people tend to just skim text online. If you want to get your message through, upgrade the format of the content – from text to video. Text is for search engines, video is for humans. Of course, this is an overstatement, since you’re human and reading this, but the point is video is a powerful format for content. Be compelling. Video lets people see and hear you, even when you’re at home asleep or eating an Italian beef sandwich. It’s a way to talk, even when your mouth is full. Be everywhere. ● eBags added video and increased conversions by 139%. Even when customers didn’t watch the video, their conversion rate was still 3.36% higher than that of customers viewing pages without video. ● Zappos improved conversion rates by 6-30% by adding videos to product pages. ● Onlineshoes.com found that visitors who watch video convert at a 45% higher rate than other visitors. That site has seen a 359% year-over-year increase in video views. ● Ice.com visitors who watch video convert to shoppers four times more often than those who didn’t. They also credit video with decreasing product returns by 25%. ● EyeBuyDirect did A/B testing and found that pages with video convert at rates four times higher than other pages. Since adding video, they’ve increased conversions by 30% site-wide. Let’s do this! How do I get started? 2. Embed your video into your website by copying and pasting the <embed> code from Viddler. Put it front and center. Ideally, put it on the home page. Video is your best foot. Put it forward. 1. Post your video to YouTube. If you have several videos, create a branded YouTube channel. Tag it and describe it with appropriate, relevant key phrases. 2. Add to your Google Local Listing. As long as you’ve claimed your local listing, this is easy to do since it works well with YouTube. 3. Add it to your Facebook page. Be sure to tag yourself or anyone else in the video. 4. Add to other local listings, such as Bing. 5. Post on other video sites, such as Flickr, Ustream and many, many others. 1. Email Marketing: Use an image from the video in your next email piece. Make it a button, so when visitors click, they land on the page with the video. Now you’re increasing traffic, as well as conversions. 2. Twitter: Fast, easy and effective, assuming you’ve been building your following. Tweet a link to the page where the video is posted. 3. Television: Where else have I seen video? Oh, yeah. On TV! Rates for placing a commercial on targeted networks might be lower than you think. Could be huge. 5. Digital Signage: Video can be used on signage networks, even if it’s just a screen in your lobby or waiting room. 6. Contests: Is it really that good? Enter it in video competitions. The prize is additional exposure. Measuring the impact on conversions is done through Google Analytics. To help you do this, consider adding a note in your Analytics (called an “annotation”) to mark the date you added the video. This will help you measure the before and after. But since the video is actually hosted at Viddler, there are other fun stats to check. 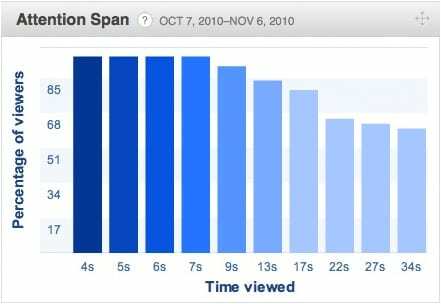 Yes, Viddler will show the number of views and total minutes viewed, but they also track how long visitors watched each video on average. This is the attention span of your viewers for that video! Questions to ask yourself: Did the viewer get bored at some point? Was it too long? Was the most important message close enough to the beginning? Use this information to make your next video even more compelling. That’s it! Did we miss anything? Besides television advertising? If you have more input on web video marketing, let us know by commenting below. This is great information! Thanks so much. You guys are really ahead of the game. Great article! I’d also like to point out that YouTube is the second largest search engine, so your suggestion of creating a branded channel is spot on.